Inspiration was mainly drawn from the landscape, the orientation in relation to views, privacy and the sun, but also strongly from the client wish to entertain guests and family visiting over longer periods. 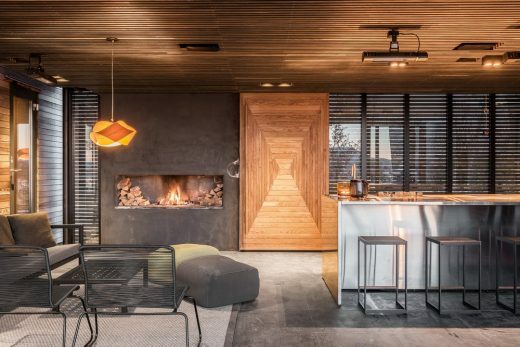 The design seeks to emphasise the closeness to the nature while allowing a comfortable stay indoors and it also seeks to underline the transition between spaces and activities we normally are too busy to appreciate. 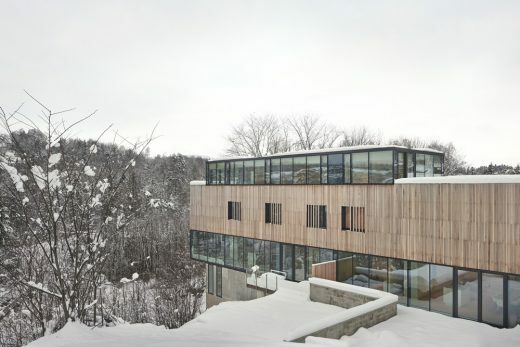 The site is positioned on a ridge rising from the fiord below and overlooks a natural opening in the forest. The entrance to the retreat is at the central wintergarden that separates the main part of the building and the annexe/sauna/relax. The building is divided into a volume for each room/function allowing several activities at the same time and the in-between spaces tells a story of journey between the different spaces and activities. Most furnishing is custom designed by Stinessen. 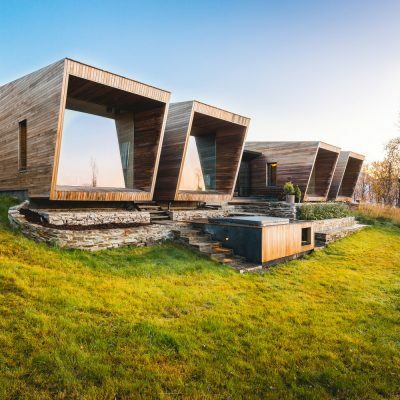 The building is comprised of several individual volumes and spaces connected via in-between spaces that provide an experience of being outdoors and symbolises the transition between spaces and functions. The conceptual idea is to tell the story of journeys in the everyday life and to emphasise the values and importance of our different activities. The organisation also allows for guests to stay over longer periods and several activities to take place without disturbing each other. The project started in 2013 and was completed July 2017. 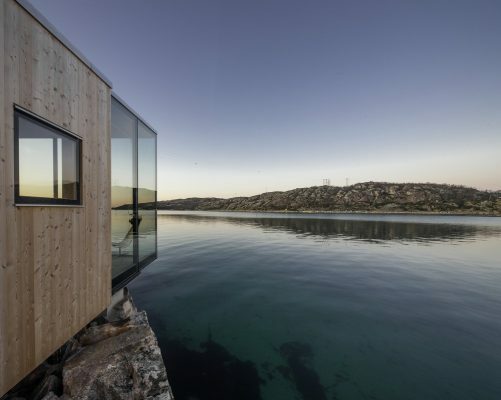 The project is located on the Malangen peninsula an hours drive southwest of Tromsø in Northern Norway. The building was positioned in consideration of the layout and vegetation of the site and built on-site. 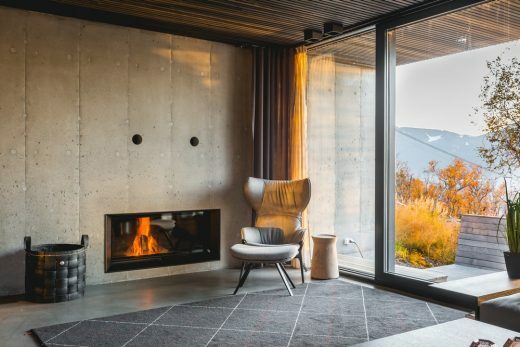 The earthbound floors of the living room, in-between spaces and the wintergarden are all in concrete to adapt to the terrain and emphasise the connection. The ceilings of these parts are made with blackened oak slats. 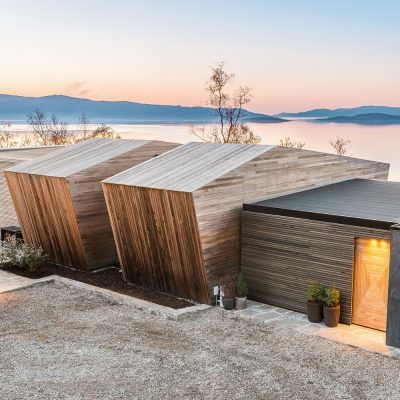 The other rooms are made as individual volumes with exterior cladding in untreated cedar, interiors all in oak. The choice of materials are made both in consideration of durability and also the atmosphere of each space. The building is comprised of several volumes and total indoor sqm is 180. Site visit, climate studies, views, privacy, movement of the sun, studies of the vegetation and nature to minimise impact. Interviews with the clients to know their functional requirements and their dreams. 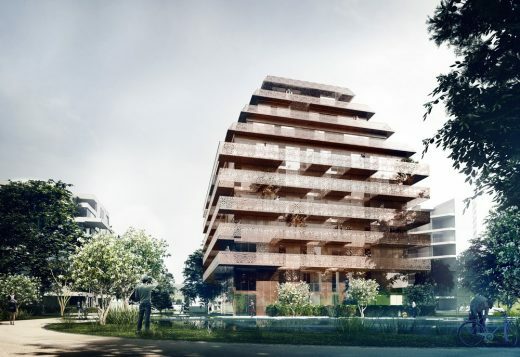 Conceptual design organizing the building on an existing ledge in the terrain, protecting a natural opening in the forest. 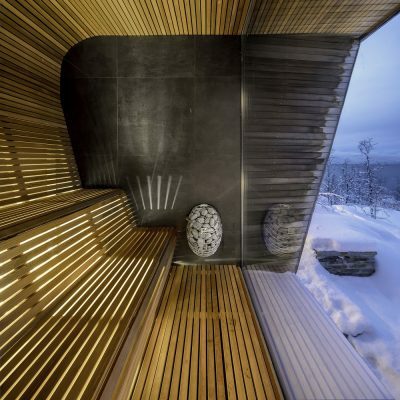 Entry into a wintergarden and the in-between spaces also functions as a response to the cold climate, creating a differentiated indoor climate and preservation of energy for heating. Sustainable approach and respect for the existing nature on site. Many factors to consider in a holistic design approach with respect to the surroundings. The most difficult part of the detail design was perhaps finding the methods to adapt to the terrain and as close to the ground as possible. The glass construction was another challenge where we wanted the glazing not to function as frames for a view, but only as a climatic border. 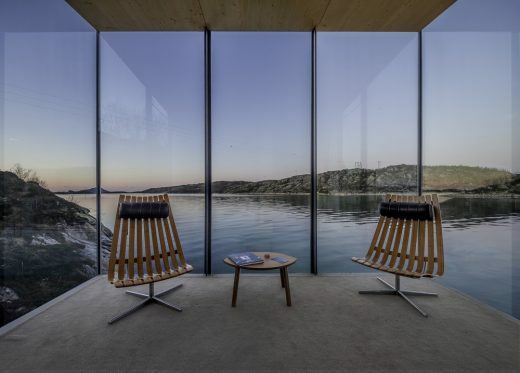 The work Malangen by Snorre Stinessen has been honored with the Platinum A’ Design Award at Architecture, Building and Structure Design Competition. FS: Could you please tell us more about your art and design background? What made you become an artist/designer? Have you always wanted to be a designer? SS: My education is architecture and industrial design from Norway and Italy. I did not really have a set goal or even a clear understanding of architecture and design when I started my education, actually perhaps just recently 😉 I have also done completely different work in my career, which at the end truly made me appreciate the fantastic privilege it is for me to be an architect. FS: Can you tell us more about your company / design studio? SS: It is originally a one man studio, but I now have a very talented assistant working from Italy. We undertake various kind of projects, but always with the philosophy of close interaction with the customer and a search for a strong conceptual idea which answers to both the clients need/scope and the site/surroundings. FS: What is "design" for you? SS: Design to me is perhaps an individual or unique approach to both understanding and answering to a task, problem, product etc. FS: What kinds of works do you like designing most? SS: Comprehensive projects where I am involved throughout the design process. in terms of a building that is both interiors and exteriors and sometimes even furniture. Large or small is not important. FS: What is your most favorite design, could you please tell more about it? SS: In product design Apple is an easy choice because they have been so design driven and focused – and partly by that so far ahead of its competitors. Now we see how an entire industry has followed. But, for me personally the architectural works of Sverre Fehn was an early inspiration. FS: What was the first thing you designed for a company? SS: Lamps and railing systems for a cinema. FS: What is your favorite material / platform / technology? FS: When do you feel the most creative? FS: Which aspects of a design do you focus more during designing? SS: A clear conceptual idea. FS: What kind of emotions do you feel when you design? SS: I guess the same as anybody else; joy, frustration, joy, frustration, more frustration etc. But, I just love it when I feel I am on the right track – that´s a good a drug as anything! FS: What kind of emotions do you feel when your designs are realized? SS: If the end-result is as envisaged it is certainly a sense of completion; reaching the end of a long journey. But, as we don´t control everything to the end result there are certainly also often some mixed feelings. FS: What makes a design successful? SS: In my mind finding and honing a clear conceptual idea. FS: When judging a design as good or bad, which aspects do you consider first? SS: I try not to judge others work. I know what I like, but that is also a personal thing. FS: From your point of view, what are the responsibilities of a designer for society and environment? SS: Certainly trying to do your best work on every project. By that I also mean you need to be personally involved. FS: How do you think the "design field" is evolving? What is the future of design? SS: Difficult question as I also feel we should be careful to over-design everything, at least just for the sake of design. Nature is the best designer we have and it seems like there is a growing movement of including sustainable solutions, materials and even nature itself in both architecture and design. Hopefully that can continue as a guideline without trying to manipulate nature too much. FS: When was your last exhibition and where was it? And when do you want to hold your next exhibition? SS: I was fortunate to have two projects exhibited at Biennale di Venezia last year. FS: Where does the design inspiration for your works come from? How do you feed your creativity? What are your sources of inspirations? SS: My sources of inspiration may be many and varied, but specifically it should be site and customer/scope when designing a building. FS: How would you describe your design style? What made you explore more this style and what are the main characteristics of your style? What’s your approach to design? SS: I do not have any deliberate design style. FS: Where do you live? Do you feel the cultural heritage of your country affects your designs? What are the pros and cons during designing as a result of living in your country? SS: I live in Northern Norway, small town called Tromsø, and the closeness to nature and sometimes harsh weather conditions have certainly affected my thinking. FS: How do you work with companies? SS: I am a strong believer of communication, listening and during the development of the process also discussing and agreeing on the way ahead. FS: What are your suggestions to companies for working with a designer? How can companies select a good designer? SS: My main advice would be the same as I would give myself – trusting your designer (or in my case the client); not blindly of course, but in a manner that you try to understand and appreciate the rationale behind their design or critique. FS: Can you talk a little about your design process? SS: My process is most often one of trying to understand my customer or the scope as best as I can, and understanding the site if applicable; before I do allow myself to have too many ideas of the design itself. The goal is to find a comprehensive conceptual idea that me and my customer can agree upon. During the project development dialogue is important both to test what you are doing and also to make your customer feel at home with what you are developing. FS: What are 5 of your favorite design items at home? FS: Can you describe a day in your life? SS: I try to keep my days as flexile as I can – also because we are a family of five and we all enjoy our time together. But, I too have office time, after which I shop for dinner and perhaps some wine, make dinner which we all enjoy together (often quite late by Norwegian standards to ensure all of us actually can come to dinner) and then I often work in the evenings as well. Work is certainly a large part of my life, but only because I enjoy it so much and have lots of interesting projects. FS: Could you please share some pearls of wisdom for young designers? What are your suggestions to young, up and coming designers? SS: Try to find yourself and your own "language". It is the uniqueness of the individual approach that gives us great new ways of thinking and understanding. But, I also believe in studying and a respect and interest for what has been done by others, but from very old times and now in our time. FS: From your perspective, what would you say are some positives and negatives of being a designer? FS: What is your "golden rule" in design? SS: Finding the right conceptual idea. FS: What skills are most important for a designer? SS: Creativity, but also problem solving and analytical skills. FS: Which tools do you use during design? What is inside your toolbox? Such as software, application, hardware, books, sources of inspiration etc.? SS: Pen and paper. My approach to software is very basic. I use VectorWorks as a software. FS: Designing can sometimes be a really time consuming task, how do you manage your time? SS: Working longer hours and not letting the stress get to me. FS: How long does it take to design an object from beginning to end? SS: That varies with the complexity of the task and many other factors. FS: Do you have any works-in-progress being designed that you would like to talk about? SS: Many very interesting projects from small to fairly large scale. One of the most exciting is an entire alpine destination and resort in Narvik. FS: How can people contact you? SS: By phone or e-mail. FS: Could you please tell us about your experience as a designer, artist, architect or creator? SS: I was educated as an architect in Norway and Italy, graduating in 1999. 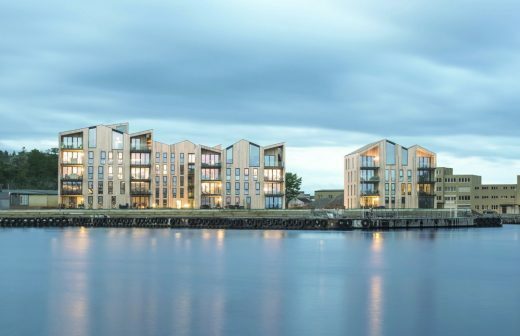 However, did other work as well for quite a few years before starting Stinessen Arkitektur in 2013, but I have always been fortunate to have been contacted by clients with some very interesting projects. FS: How did you become a designer? SS: The choice of education was perhaps a bit by chance, but certainly by heart, in as much as I had no clear idea of what I wanted to do at that time. After graduating I also had some years where my main work was something else entirely. Today, however I feel I fully understand the privilege I have being a designer and architect and that is something I cherish every day. FS: What are your priorities, technique and style when designing? SS: For every design I start by gathering as much information about all the elements that need to be taken into account and then try to understand them in a manner that enables me to come up with a conceptual design or idea that is not only analytical, but is also about gut feeling or subconsciousness. The next step is to discuss the conceptual design with my client – where the goal always is to agree that we are on the right path. If I can not convince my client of the first idea it should be reviewed again. FS: Which emotions do you feel when designing? SS: I guess most will describe a design process as a bit of a roller coaster and of course it is. To me seeing the end result is rewarding if it really turns out as planned, but the most exciting part is the initial idea phase. All the phases in between are full of ups and downs, but fortunately for me I am mostly a very happy designer. FS: What particular aspects of your background shaped you as a designer? SS: This is a difficult question, but I believe in trusting your gut feeling. The ability to keep calm under stress is probably also useful and probably enables me to focus more on the task at hand at any stage in the process. FS: What is your growth path? What are your future plans? What is your dream design project? SS: To me the dream project is most likely my next new assignment – regardless of size, location or use. My main goal as an architect and designer would be to do as good a job as I can on any project. FS: What are your advices to designers who are at the beginning of their career? SS: Trust your instincts and believe in yourself – that is after all what makes you special and who knows that may be exactly what leads us into the future. For most there will be time needed to actually learn the trade and my best advice would be to actually be willing to learn and understand. Soak up as much as you can along your way, but do not let it get in the way of who you are. FS: You are truly successful as a designer, what do you suggest to fellow designers, artists and architects? SS: To me design is a personal profession and process. The variety of personalities and approaches to good design is what makes it interesting, however I feel we should all remember to be humble in front of each new project or task we are presented with. Listen to our clients and to our surroundings and respect the nature. FS: What is your day to day look like? SS: I do not have too many routines apart from daily family life and try to keep it that way. Flexibility and new angles gives inspiration. FS: How do you keep up with latest design trends? To what extent do design trends matter? SS: I find myself looking more backwards into history and trying to follow what others are doing. There is so much knowledge in history that is often overlooked or forgotten. Knowledge and experience that is lacking in many projects today. FS: How do you know if a product or project is well designed? How do you define good design? SS: Good design can be understood from so many different perspectives and individual approaches to it, but to me I guess thoughtfulness and care is part of it. There is also the famous x-factor to the best design. FS: How do you decide if your design is ready? SS: To me the design, the conceptual design, needs to respond well to my gut feeling and all the choices of the continued design process needs to adhere to the conceptual design. At some stage you should restrain from over-designing, but to find that spot is of course very difficult, but a strong conceptual idea should also be able to absorb some things left to chance. FS: What is your biggest design work? SS: I guess Manshausen Island Resort probably is the project I have spent most time working on and at the same time been able to work on all details of the design from site planning to buildings to interiors and furniture. The key to success was the team we were able to put together who all had the same goal in mind. Although a larger project, I feel Narvik Arctic Resort that we are currently working has the same energy from all parties involved that should make it a very interesting project at the end. FS: Who is your favourite designer? SS: There are many great architects out there, but I guess Sverre Fehn is one of my biggest sources of inspiration. However there are of course many others. FS: Would you tell us a bit about your lifestyle and culture? SS: I live in Northern Norway, well above the arctic circle, and I guess the exposure and respect we have to nature living here also reflects in my designs. I travel quite a lot, either for work or with my family and love the inspiration from other places. Currently we are working on projects in several countries and to me it is a gift to be able to work in different cultures and with different kinds of people. FS: Would you tell us more about your work culture and business philosophy? SS: My experience has shown me what a true privilege it is to be an architect and designer. We are a very small studio with me in the office here in Tromsø while my assistant lives in Italy. This arrangement is partly by chance, but I am very conscious about retaining my freedom to work closely with all the projects we take on and the freedom to do what I actually love to do – design. FS: What positive experiences you had when you attend the A’ Design Award? SS: The A´Design Award is a potential great recognition on the work we are doing and good feedback is always welcome! It has also been a fantastic opportunity for exposure of our projects and a great window to the outside world. Receiving an award is not only good for the confidence in what we are doing, but it also gives you a sense of responsibility to do your best on all projects.